What is the Jubilee year? Why is it important? How is it related to Jesus' first message? In the Bible, the year of Jubilee occurs after seven sets of seven yearly intervals (49 total) are completed. The fiftieth or "liberty" year is proclaimed on one of God's annual feast days known as the Day of Atonement. Because God owns everything, he set up a special, regularly occurring time period called the Jubilee when a man's possessions would be returned to him. This fiftieth (Jubilee) year is sacred - it is a time of freedom and of celebration when everyone will receive back their original property, and slaves will return home to their families . . . If one of your brothers becomes indigent and has to sell himself to you, don't make him work as a slave. Treat him as a hired hand or a guest among you. He will work for you until the Jubilee . . . (Leviticus 25:10, 39 - 40). Israel was also commanded in the Bible to redeem tithes and other things based on how long it was to the next Jubilee period (Leviticus 27). What is the destiny of America? Leviticus 26 states THE reason ancient Israel went into captivity was for not allowing the land to rest every seven years - by not giving it a break and letting it enjoy its own Sabbath rest! Scripture states, "If in spite of this you still do not listen to me but continue to be hostile toward me, then in my anger I will be hostile toward you . . . I will scatter you among the nations . . . Your land will be laid waste . . ." (Leviticus 26:27 - 28, 33). Jesus, near the start of his public ministry, quoted a section of Scripture related to the Jubilee. He stated, "The Spirit of the Lord is upon Me; for this reason, He has anointed Me to preach the gospel to the poor . . . to send forth in deliverance those who have been crushed, to proclaim the acceptable year of the Lord" (Luke 4:18 - 19, HBFV). Jesus was quoting from Isaiah 61, verses 1 and 2. His reference to the "acceptable year of the Lord" is a Biblical synonym for the Jubilee year. The Liberty Bell, initially cast in 1752 A.D. (now in Philadelphia), is an iconic symbol of American independence. The bell's first inscribed line quotes part of the verse found in the King James Bible version of Leviticus 25:10 which mentions the jubilee. The bell rang on July 8th, 1776 to summon the people to hear the Declaration of Independence. Unfortunately, the United States has not obeyed the Jubilee Law. It is widely believed the bell received its crack in 1835 A.D. while being rung. 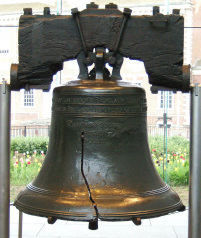 The crack, which occurred roughly fifty years after America's War of Independence ended in 1783, was severe enough to cause the bell never to ring again. Josephus, in his monumental work on the history of the Jewish people, discusses historical events that he felt occurred during Jubilee years such as Antiochus' besieging of Jerusalem's Temple. In Herod the Great's thirteenth year of rule there was famine and a corresponding pestilence, the worst since the time of King Ahab. Josephus states it occurred in a Jubilee year. The designating of every 50th year as a Jubilee is not just for allowing the land to rest. It is a reminder, just like the weekly seventh-day Bible Sabbath, that God has created everything. It is also a reminder that humans are not the only owners of the land and are not to hold onto property forever. Because we are thankful to God for liberating us, we should also liberate others from debt to us. Any nation would receive a tremendous blessing if they observed the Jubilee! People would not ring up huge debt and there would be no great imbalance between the wealthy and the poorest. The value of land would stabilize and the usual giant ups and downs of the economy would not happen. God's laws would be taught every seventh year. Sadly, we will have to hold on until the Millennial reign of Jesus Christ before the world in willing to obey him. Although Christ's ministry started in 26 A.D., his public proclaiming of the gospel began in 27. His quoting of Isaiah 61 could be taken as referencing he was preaching within a Jubilee year, which would have begun on Atonement in 26 A.D. (Apppointed Times of Jesus the Messiah, page 23). If this conclusion is true, it means the next one will begin in the fall of 2026 and run to the fall of 2027. Why is the year of Jubilee important? It is because it offers a warning to the modern-day children of Israel (Amos 3:7, Daniel 12:4, John 7:17) not to commit the same mistakes as their ancestors in the Bible. What is the Day of Atonement? Where are the lost tribes of Israel? Who was Israel's greatest enemy?